Fiery Fruit & Quinoa Salad Recipe shared by Oh My Veggies! I have a very distinct memory of being in pre-school and coloring something blue and having the crayon ripped out of my hand by a boy yelling, “Blue is for booooys!” Ha ha, pre-schoolers, right? It’s a good thing we all grow up and discard crazy ideas like that. Except that we don’t. Because what’s the ultimate test for a vegetarian recipe? Very often, it’s “would a man eat this?” I mean, duh, men eat steak! Vegetarian food is for ladies. If a man would eat a veggie burger, then you know it’s good. This seems to be doubly true with salads. Why can’t a man like a salad? What makes salad a feminine food? Is the belief that men don’t eat salad any less ridiculous than that 4-year-old boy who wouldn’t let me color with a blue crayon? Salad is for everyone! Except people who hate salads! And salad haterism knows no gender! I happen to be a reformed salad hater, but now that I like salads, I really like salads. I try to plan a salad dinner at least once a week, and sometimes more often now that it’s summer and I hate having big heavy dinners when it’s hot out. 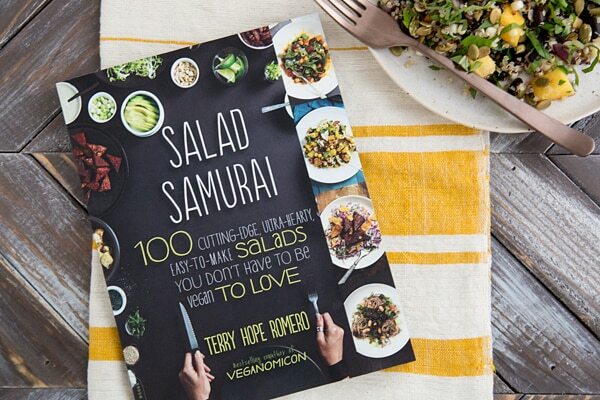 When I received a review copy of Terry Hope Romero’s Salad Samurai , I was pretty darn giddy because there are 100 salad recipes in this book — 100 salad recipes that are creative, easy, and substantive. These are not anemic little side salads! I’ve made the Pepperoni Tempeh Pizza Salad and the Blueberry Tamari Greens Bowl, both of which knocked my socks off. (I mean, pizza salad. Need I say more? Pizza. Salad.) Then, because it’s summer and I can’t get enough peaches or corn, I made the Fiery Fruit & Quinoa Salad, which I’m sharing below. 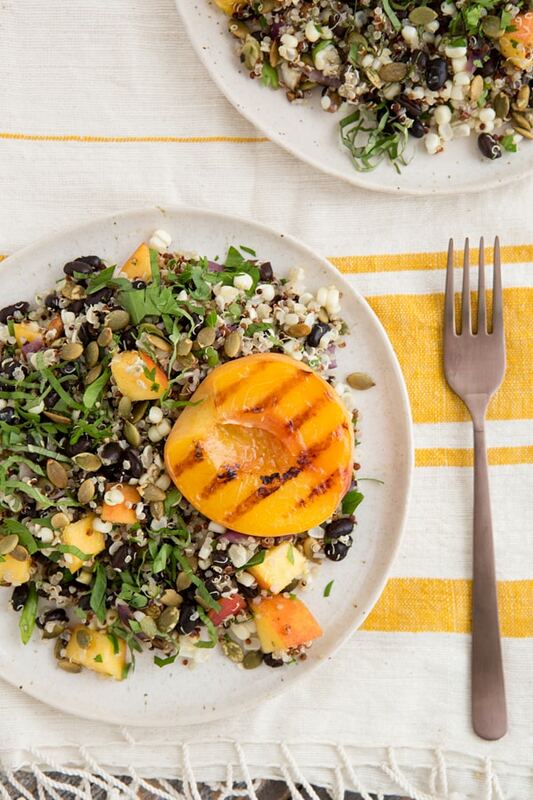 Corn, red onions, and peaches are grilled to perfection, then tossed with quinoa and a Chia Chipotle Dressing. Although the recipe says it serves 2, we got 4 decent-sized servings out of it when I made it. NEED a copy of this book so you can get your hands on all these amazing salad recipes? Purchase it on amazon.com . A sweet-and-spicy quinoa salad from Terry Hope Romero’s Salad Samurai. Whisk together all of the dressing ingredients in a glass or plastic measuring cup. Cover and chill for 10 minutes or overnight to plump up the chia seeds. Pour the quinoa, beans, and fresh herbs into a large mixing bowl. Keep this mixture chilled while you grill the remaining ingredients. Preheat a cast-iron grill pan over medium-high heat, or heat an outdoor grill as per manufacturer’s directions. Rub the fruit and veggies with a thin coating of olive oil and sprinkle with a pinch of salt. Grill the onions until browned, about 3 minutes; set aside. Grill the peaches on each side for about 2 minutes, until the outside is hot and slightly charred; set aside. Grill the ears of corn until the kernels are lightly charred, turning the cobs occasionally, 3 to 4 minutes. Cool the vegetables and fruit just enough to be handled safely, then dice into bite-sized pieces. Use a knife with a thin blade to slice the corn kernels off the cobs. You should! 😀 It’s one of my favorite cookbooks that I’ve gotten this year. I bought this cookbook immediately, as a HUGE salad lover, and I’ve loved every single recipe I’ve tried. my one and only complaint is that the serving sizes are all over the place. The book says this recipe (which is freaking delicious!) is 2 servings!!! We could’ve easily made this into 5 servings. I recommend this book to everyone!! If you haven’t tried it, make the bbq tempeh ‘n dilly slaw salad. Hahah and I just saw your note about the serving size! This post brings back memories of Charlie Black-the boy who ate everything, including glue and crayons-from my elementary school days 🙂 Lovely salad, and even though my man loves his meat, I bet he would totally dig this salad too! So a cookbook about salads, yum ! Are whole family loves salads/green drinks… Do you post everyday? This looks amazing and it’s so beautiful! Wow, that is one gorgeous salad. You can’t go wrong with quinoa, and, with that added peach, I’m all in. I’m not usually one for salad but this looks great! Can’t wait to try it! Just experienced my first grilled peach this weekend… now I want to put it in ere’thang. yay! Salads can definitely be hit or miss for me (mostly because of my disdain for anemic salads) but a whole book full of fun, exciting main dish salads?! Music to my ears. I love how so much of summer is packed into this. Plus the dressing, which sounds good enough to drink.